[Source: Tom Beal, ARIZONA DAILY STAR] – David Gang’s laboratory and the kitchen he shares with his wife and six children contain some of the same ingredients. 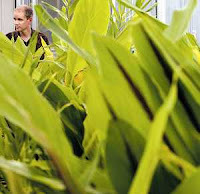 At the University of Arizona, where he is a professor in the Department of Plant Sciences, Gang grows turmeric and ginger plants in greenhouses on the roof of a parking garage on East Sixth Street. He raises basil plants in controlled chambers in the basement of the Bio5 Research Institute across campus. At home, Gang sprinkles turmeric on just about everything he cooks, even adds it to fruit smoothies. Turmeric, a staple of Indian cooking that gives curries their bright yellow color, doesn’t flavor things all that much, he said. “The kids don’t even notice it,” he said. Ginger and basil also figure in their diet. They taste good, Gang said, and they are good for you. He knows ginger works. He’s been chewing it for years since discovering that it eased an undiagnosable stomach ailment he developed during his graduate school years. Gang said his recovery is part of the reason he decided to concentrate his research on learning how plants make the remarkable substances that modern scientists are just beginning to study for their healthful effects. Gang and his group are trying to identify and uncover the distinct compounds that make them work. Turmeric is hot in natural healing circles, having been reidentified in recent years as a potent anti-inflammatory, with possible beneficial effects for everything from arthritis to Alzheimer’s disease. Gang said medical researchers have identified regions in India with very low incidences of the two diseases. They happen to be regions in which turmeric is most widely used in food preparation. Scientists have isolated the main active ingredient in turmeric, curcumin, but Gang is also interested in two other compounds found in the rhizome of turmeric that have up to 100,000 times the anti-inflammatory potency of curcumin. It’s one of the reasons Gang believes it’s more beneficial to actually eat the spices than it is to take supplements of isolated compounds, he said. “I’ve always been more holistic when it comes to your health,” he said. “You’re better off using it as part of your diet than waiting till you get sick and taking a supplement,” he said. The fruits of the research Gang conducts could be many and varied. Working at Bio5, said Gang, gives him the opportunity to interact with researchers in other fields who might be able to make use of what he discovers. One colleague is already looking to form a private company to develop pharmaceutical remedies from the compounds he isolates. The research could also lead to targeted breeding of new varieties of plants, Gang said. A chemist by training, he now combines biochemical analysis with genomics into a field called biochemical genomics. Studying aromatic plants such as sweet basil, ginger and turmeric seems fruitful, said Gang, because the substances that have anti-oxidant, anti-inflammatory and even cancer-preventive properties are isolated in distinct sections of the plants, such as the rhizomes of ginger and turmeric. Someday, products made from the fruits of Gang’s research may cure what ails you. In the meantime, Gang suggests you simply spice up your meals.
? Contact reporter Tom Beal at 573-4158 or tbeal@azstarnet.com.